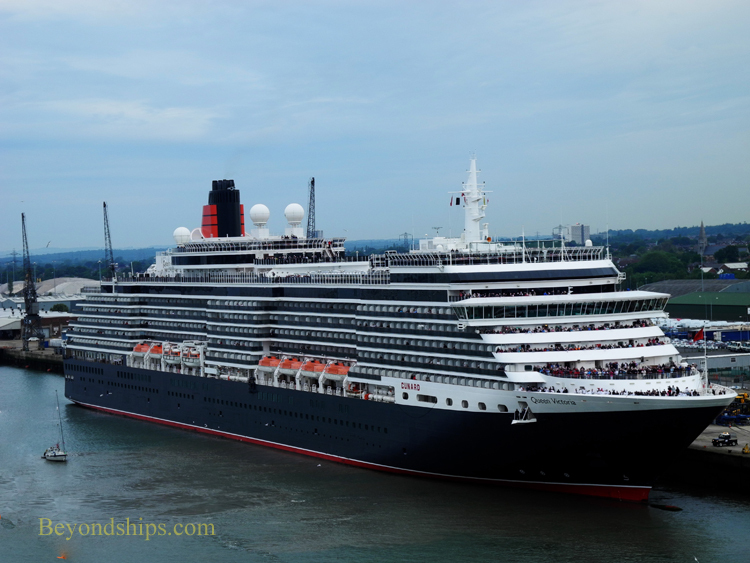 Above: Queen Victoria, followed by Queen Elizabeth, follow Queen Mary 2 into Southampton harbor on the morning of 5 June 2012. Below: Queen Mary 2 proceeds towards the turning basin at the far end of the harbor. Above: Queen Elizabeth maneuvers past small craft on her way to her berth. Below: QM2 executes a 180 degree turn. Above: QM2 approaches her fleetmates. Right: Cheers go up from Queen Victoria as QM2 passes by. Below: More ship whistles and cheering as QM2 approaches Queen Elizabeth. Below right: QM2 docked at the Ocean Terminal following the morning celebrations. As first light illuminated the area, one could see that there was a solid cloud cover. Although it was rather cold, it was not raining and the visibility was not bad. Queen Mary 2 was scheduled to dock at the Ocean Terminal. However, she passed that by and proceeded the length of the harbor to the turning basin at its far end. 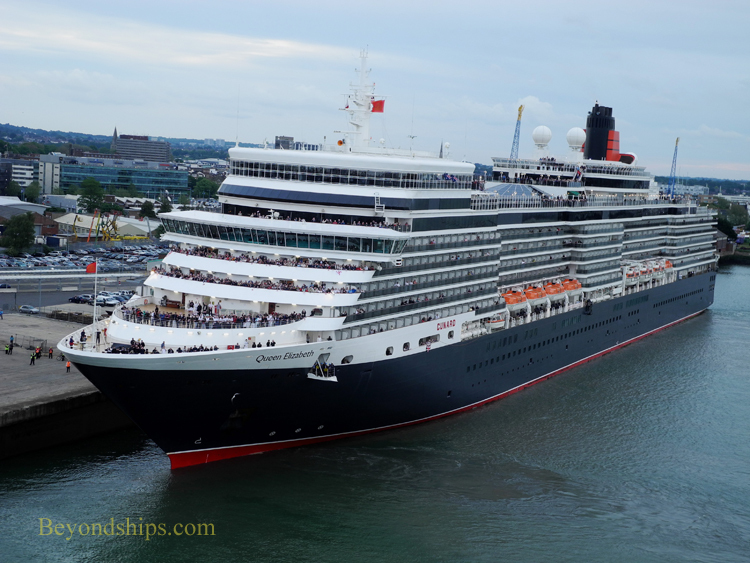 While QM2 was tuning 180 degrees in order to retrace her steps back to the Ocean Terminal, Queen Victoria was also executing a 180 degree turn so that she could dock with her bow pointing toward the entrance of the harbor. Queen Elizabeth, which had been following some distance behind, proceeded towards the City Terminal and docked with her bow a short distance from Queen Victoria’s bow. As the two ships are of similar design and are painted the same way, they looked like two giant matched bookends. 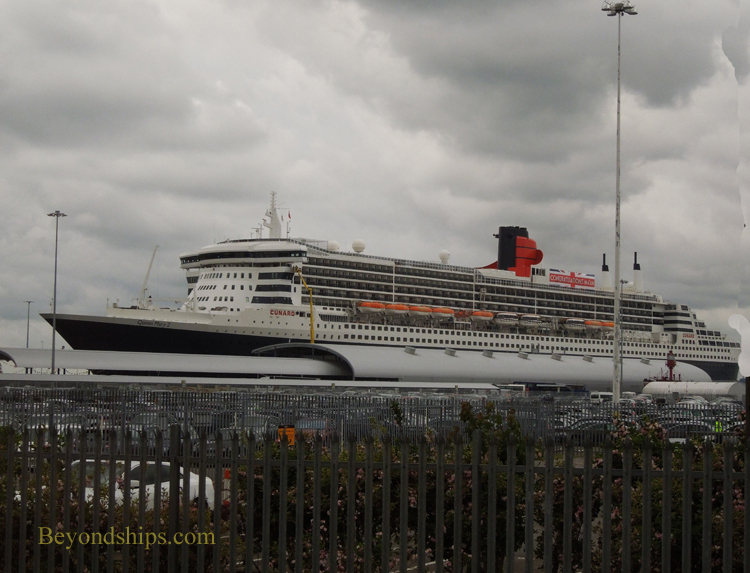 Having completed her turn, Captain Kevin Oprey maneuvered Queen Mary 2 along side of the Queen Victoria. As the captain had specified, QM2’s public address system was playing British rock and contemporary music. By this time, the open decks of all three ships were covered with cheering passengers, many waving Union Jacks. On the bow, costumed members of the ship’s production cast and members of the Royal Academy of Dramatic Arts troupe mixed with off-duty crew members who were joining in the enthusiasm. In nearby Mayflower Park, a sizeable gathering of spectators had gathered. Other onlookers watched from small boats and ferries. QM2 paused by her fleetmates so that the bows or all three ships were close together. The ship’s whistles were sounded and cheers were exchanged. QM2 then continued on to her berth at the Ocean Terminal. It had been a good start to what promised to be a spectacular day.